The Ferrari Dino engine is a line of mechanically similar V6 and V8 engines produced by Ferrari for about 40 years from late 1950s into the early 2000s. 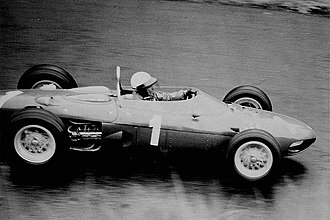 Alfredo "Dino" Ferrari was the son of Enzo Ferrari. 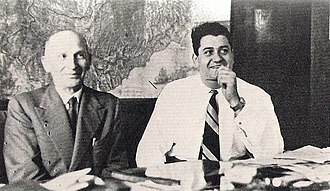 Dino suggested to Enzo Ferrari the development of a V6 engine for F2 at the end of 1955. Soon afterwards, Alfredo fell ill, suffering from muscular dystrophy. While hospitalized, he discussed technical details with the engineer Vittorio Jano. Dino would never see the engine; he died on June 30, 1956 at the age of 24. The Dino V6 was Ferrari's first V6 engine. The Dino V8 engine was introduced later. The V8 engines all used a flat-plane crankshaft configuration. The production Dino V6 began as a discussion between Vittorio Jano and Enzo and Dino Ferrari about the ideal 1.5 L engine for use in the 1958 Formula Two auto racing series. Jano, formerly of Alfa Romeo and Lancia, pressed for a conventional 60° V6 but the Ferraris were open-minded. Jano's 60° design incorporated some of his ideas from the Lancia Aurelia, and were used in a number of Formula One, Formula Two, and Grand Prix cars from 1959 through the early 1960s. Appearing in 1958, it used a 77 mm × 71 mm (3.03 in × 2.80 in) bore and stroke for 1,984 cc (2.0 L) and produced 200 bhp (149 kW; 203 PS) in the 196 S. Two larger versions were also produced, the 245 bhp (183 kW; 248 PS) 2,497 cc (2.5 L) 246 S and 296 bhp (221 kW; 300 PS) 2,962 cc (3.0 L) 296 S. These engines continued in the 1962 196 SP and 286 SP. The latter had a bore and stroke of 90 mm × 75 mm (3.54 in × 2.95 in) for 2,863 cc (2.9 L) and 260 bhp (194 kW; 264 PS). Ferrari designers began work on the first Dino V6 engine in 1956 and the engine was running by the end of the year. The engine displaced 1,489 cc (1.5 L; 90.9 cu in). This engine was installed in the Ferrari 156 F2 car and was first raced in the Grand Prix of Naples in April 1957, where it finished in third place behind two Lancia-Ferrari V8 Formula One cars. 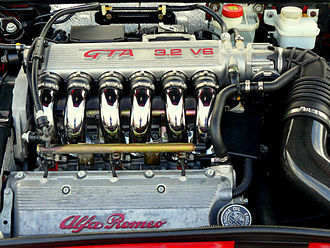 The result of the trio's creativity was the world's only 65° V6 engine. 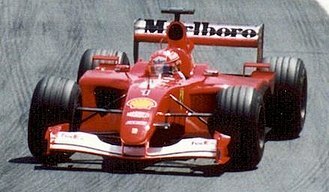 The extra 5° between cylinder banks gave Ferrari the straight intakes he wanted. As this engine was not a true V6 but had a separate crankpin for every connecting rod, the crank pins were offset by 55 degrees within every pair of cylinders. This ensured an even firing order for the complete engine as well as an even distance between firing pulses per cylinder bank. 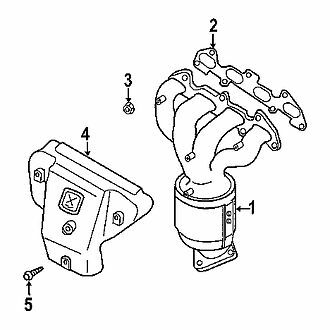 Thus the engine was as smoothly running as a conventional 60 degree V6, but had greatly enhanced potential for the design of harmonically balanced exhaust manifolds, giving much better performance. Although the Dino V6 was discontinued with the introduction of the V8, the 65° design continues to this day: It reappeared on Ferrari's 1992 456 V12. 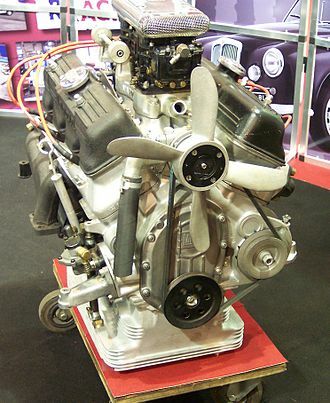 The 85 mm × 71 mm (3.35 in × 2.80 in) 2,417 cc (2.4 L; 147.5 cu in) engine used in the 246 S/I produced 280 PS (276 bhp; 206 kW) with dual overhead camshafts pushing two valves per cylinder. The rear mid-engine, rear-wheel-drive layout 1961 246 SP used this same engine, as did the 156 F1. 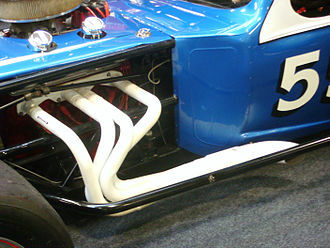 The 65° Dino V6 quickly replaced the 60° unit in racing, and made its way to the street as well. Ferrari needed to have the engine in 500 production vehicles to homologate it for racing use. The company worked with Fiat to develop a sports car to house it, and the front-engine, rear-wheel-drive layout Fiat Dino project was born. In competition, the 1965 166 P used a tiny 1,593 cc (1.6 L; 97.2 cu in) version of the 65° unit. Both bore and stroke were different from the earlier engine at 77 mm × 57 mm (3.03 in × 2.24 in) and output was impressive at 175 PS (129 kW; 173 bhp). Bore was up to 86 mm (3.39 in) for the 218 PS (215 bhp; 160 kW) 1,987 cc (2.0 L; 121.3 cu in) version found that same year in the 206 SP as well as the 1966 206 S.
In 1968, Ferrari debuted its own Dino 206, the company's first mid-engined road car. It used the 2.0 L engine from the 206 SP transversely-mounted between the rear wheels. After producing just 157 cars, Ferrari bumped the bore and stroke up from 86 mm × 57 mm (3.39 in × 2.24 in) to 92.5 mm × 60 mm (3.64 in × 2.36 in) for 2,419 cc (2.4 L; 147.6 cu in). This increased power to 195 PS (192 bhp; 143 kW) at 7600 rpm and 226 N⋅m; 166 lbf⋅ft (23 kg⋅m) at 5500 rpm, but the engine block was now made of cast iron rather than aluminium. The same V6 engine was handed off to Lancia for use in its WRC-champ Stratos in the early 1970s, but Ferrari's Dino had moved on to 8 cylinders. Dino's project also created a V8 engine with a conventional 90° bank angle. 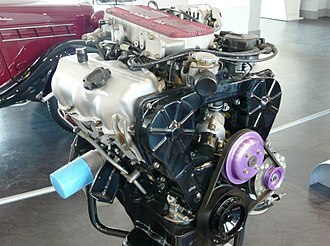 First appearing in 1962's 268 SP, the new V8 used the same bore x stroke 77 mm × 71 mm (3.03 in × 2.80 in) as the Colombo V12. Output from the single overhead camshaft engine was 265 PS (195 kW; 261 bhp). 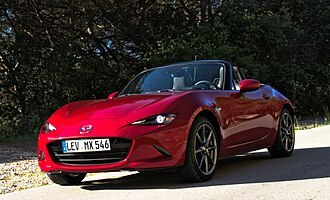 A smaller version was also produced, with stroke dropped to 66 mm (2.60 in) for 2,459 cc (2.5 L). This engine was used in the 248 SP and produced about 250 PS (184 kW; 247 bhp). The Dino V8 was retired in 2004 with the introduction of the new F136 engine used in the Ferrari F430. The Dino V8, now bored to 81 mm (3.19 in), replaced the V6 in the next line of street Dinos to be produced by Ferrari, the 1973 GT4 and 1975 GTB "308" cars. Although the model name suggests 3.0 L, the V8 displaced only 2,927 cc (2.9 L) which rounds down to 2.9 L and was another DOHC 2-valve design. The 1980 "i" models added fuel injection to the existing 2,927 cc (2.9 L) engine. 4 valves per cylinder were added for the 1982 308 and Mondial Quattrovalvole (or QV), bringing power back up to the pre-FI high of 245 PS (180 kW; 242 bhp). A very unusual Dino Quattrovalvole was used in the Lancia Thema 8.32. It was based on the 308 QV's engine, but used a cross-plane crankshaft rather than the Ferrari-type flat-plane. The engine was constructed by Ducati rather than Ferrari, and was produced from 1986 through 1991. 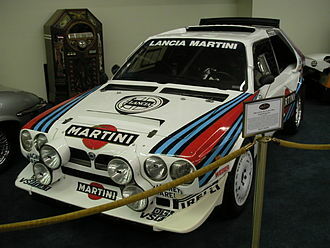 The Quattrovalvole was also used by Lancia for their attempt at the World Sportscar Championship with the LC2. The engine was twin-turbocharged and destroked to 2.65 litres, but produced 720 PS (530 kW; 710 bhp) in qualifying trim. The engine was later increased to 3.0 litres and increased power output to 828 PS (609 kW; 817 bhp). These small V8 variants were chiefly intended for the domestic market, where cars with engines larger than two-litre incurred in an almost doubled 38% value added tax. 1982 saw the introduction of the 208 Turbo. The 208 Turbo featured 220 PS (162 kW; 217 bhp), more than the fuel injected 308 from the previous year. The turbo also served as a development platform for the forthcoming 1984 288 GTO sports car. That famous Ferrari was meant for Group B racing, with a 2,855 cc (2.9 L) version of the 308's engine (bore was down by 1 mm (0.04 in) to meet the regulations of the class). With IHI twin-turbochargers, a Behr intercooler, and Weber-Marelli fuel injection, the GTO boasted 400 PS (294 kW; 395 bhp) from Dino's engine. 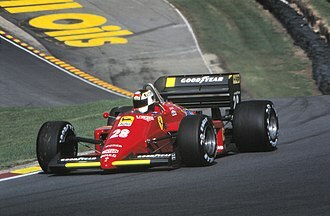 The 1985 328 and 3.2 Mondial used a bored and stroked 3.0 QV V8 to 83 mm × 73.6 mm (3.27 in × 2.90 in) version called the Tipo F105CB. That naturally aspirated 3,186 cc (3.2 L) engine boasted 270 PS (199 kW; 266 bhp). In 1987, the F40 sports car debuted with the Tipo F120A engine. The 2.9 L (2,936.25 cc) Dino-based engine now had a bore x stroke of 82 mm × 69.5 mm (3.23 in × 2.74 in) and 16 psi (1.1 bar) of turbo boost for 351.5 kW (478 PS; 471 hp) at 7000 rpm and 577 N⋅m (426 lbf⋅ft) of torque at 4000 rpm while the US designated engines, code named the Tipo F120 D were rated at 356 kW (484 PS; 477 hp). The 1989 introduction of the 348 and Mondial t saw the Dino V8 pushed to 3.4 L (3,405 cc) with a bore x stroke of 85 mm × 75 mm (3.35 in × 2.95 in). Power was up to 300 PS (296 bhp; 221 kW) in the Tipo F129D/G, and revised as the Tipo F119H with 320 PS (316 bhp; 235 kW) in later Ferrari 348s. The 1994 F355 included their first production 5-valve engine, and sported a 2 mm (0.08 in) longer stroke for 3.5 L (3,496 cc) and 380 PS (375 bhp; 279 kW). This Tipo F129B was used from 1994 through 1998. It was revised as the Tipo F129C, debuting in 1998 and used through 1999. The 1999 360 Modena retained the 85 mm (3.35 in) bore of the F355 engine, but increased the stroke to 79 mm (3.11 in), to raise the displacement again to 3.6 L (3,586 cc) and 400 PS (395 bhp; 294 kW). Modifications to the intake/exhaust and an increased 11.2:1 compression ratio produced 425 PS (419 bhp; 313 kW) for the 360 Challenge Stradale. This Tipo F131 was produced from 1999 through 2004. A new V12 engine family debuted in the 1992 456 as the Tipo F116. It featured the Dino 65° V angle with an 88 mm bore and the same 75 mm stroke as the Dino V8 found in the 348. It was then revised again as the "Tipo F133" and used in the front engined 550 (5.5 litre) and later in 575M Maranello and 612 Scaglietti (5.75 litre). ^ "Ferrari 246 F1 Dino". Ultimatecarpage.com. 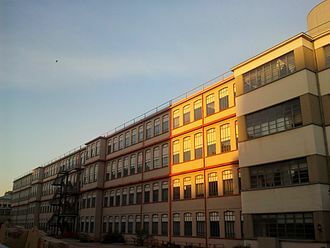 2006-11-09. Retrieved 2010-12-01. The Lancia Aurelia is a car produced by Italian manufacturer Lancia from 1950 to the summer of 1958. It is noted for using the first production V6 engine, several body styles were offered—4-door saloon, 2-door GT coupé, 2-door spider/convertible —as well as a chassis to be custom bodied by external coachbuilders. Establishing a post-war Lancia tradition, the car was named after a Roman road, the Aurelia was designed under the direction of engineer Vittorio Jano. Its engine, the first production V6 engine, a 60° design developed by Francesco de Virgilio—who was between 1943 and 1948 a Lancia engineer, and who worked under Jano. During production, capacity grew from 1.8 L to 2.5 L. Prototype engines used a bore and stroke of 68 mm x 72 mm for 1569 cc and it was an all-alloy pushrod design with a single camshaft between the cylinder banks. A hemispherical combustion chamber and in-line valves were used, a single Solex or Weber carburettor completed the engine. Some uprated 1991 cc models were fitted with twin carburettors, at the rear was an innovative combination transaxle with the gearbox, clutch and inboard-mounted drum brakes. The front suspension was a sliding design, with rear semi-trailing arms replaced by a de Dion tube in the Fourth series. The Aurelia was first car to be fitted with radial tires as standard equipment, initially 165SR400 Michelin X and the sports models fitted 165HR400 Pirelli Cinturato. B21 engine technical specifications Bore,72. 00mm, Solex 30 AAI,23 and 24mm venturis. The very first Aurelias were the B10 berlinas and they used a 1754 cc version of the V6 which produced 56 hp. The B21 was released in 1951 with a larger 1991 cc 70 hp engine, a 2-door B20 GT coupé appeared that same year. It had a wheelbase and a Ghia-designed, Pininfarina-built body. The same 1991 cc engine produced 75 hp in the B20, in all,500 first series Aurelias were produced. The second series Aurelia coupé pushed power up to 80 hp from the 1991 cc V6 with a compression ratio. Other changes included better brakes and minor styling tweaks, such as chromed bumpers instead of the ones used in the earlier car. A new dashboard featured two larger instrument gauges, the suspension was unchanged from the first series. A transverse engine is an engine mounted in a vehicle so that the engines crankshaft axis is perpendicular to the long axis of the vehicle. Many modern front wheel drive vehicles use this engine mounting configuration, the Critchley light car, made by the Daimler Motor Company in 1899, had a transverse engine with belt drive to the rear axle. A1911 front-wheel drive car had an engine with a clutch at each end. The first successful transverse-engine cars were the two-cylinder DKW Front series of cars, after the Second World War, SAAB used the configuration in their first model, the Saab 92, in 1947. The arrangement was used for Borgwards Goliath and Hansa brand cars. However, it was with Alec Issigoniss Mini, introduced by the British Motor Corporation in 1959, Issigonis incorporated the cars gearbox into the engines sump, producing a drivetrain unit narrow enough to install transversely in a car only four feet wide. Coupled to the much greater interior space afforded by the layout this made the Mini a genuine alternative to the small family car. 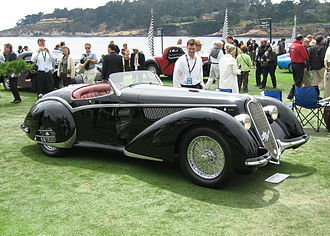 This design reached its ultimate extent starting with Dante Giacosas elaboration of it for Fiat and he connected the engine to its gearbox by a shaft and set the differential off-center so that it could be connected to the gearbox more easily. The axleshafts from the differential to the wheels therefore differed in length, Giacosas lay-out was first used in the Autobianchi Primula in 1964 and in the wide-selling Fiat 128. With the gearbox mounted separately to the engine cars were by neccesity larger than the Mini. The Giacosa lay-out provided superior refinement, easier repair and was better-suited to adopting five-speed transmissions than the original Issigonis in-sump design, now most small and small/medium-sized cars built throughout the world use this arrangement. The Lamborghini Miura used a transverse, mid-mounted 4 and this has allowed for improved safety in a frontal impact, due to more front to back engine compartment space being created. The result is a front crumple zone. Transverse engines have widely used in buses. The Fiat Dino is a front-engine, rear-wheel-drive sports car produced by Fiat between 1966 and 1973. The Dino name refers to the Ferrari Dino V6 engine, produced by Fiat, the Dino road cars came to be because of Enzo Ferraris need to homologate a V6 engine for Formula 2 racing cars. In 1965 the Commission Sportive Internationale de la FIA had drawn up new rules, in his memory, V6-engined Ferrari sports prototype racing cars had been named Dino since the late 1950s. The conversion of this engine for road use and series production was entrusted to the engineer Aurelio Lampredi. Even on the block casting, the name FIAT was visible which was not in line with the newly created DINO make. Curiously the Spider type approval identified it as a 2+1 seater, option lists for both models were limited to radio, metallic paint, leather upholstery, and for the Spider a vinyl-covered hardtop with roll-bar style stainless steel trim. The car was offered with an all-aluminium DOHC2.0 L V6, the same 2. 0-litre engine was used in mid-engined, Ferrari-built Dino 206 GT, which was introduced in pre-production form at the 1967 Turin Motor Show and went on sale in 1968. Jean-Pierre Gabriel in Les Ferraris de Turin notes that, La declaration de Ferrari ne reposait sur aucun fondament technique—Ferraris statement had no technical basis, the real reason for this difference was a mistake in between quotes made in SAE and BHP power output. In 1969, both Ferrari and Fiat introduced new 2. 4-litre Dino models, the Fiat Dino 2400 premiered in October 1969 at the Turin Motor show, besides the larger engine, another notable improvements was independent rear suspension. The V6 now put out 180 PS, and used a cast iron instead of the light alloy engine block. Tyres, and up-sized brake discs and callipers, both models were now badged Dino 2400. On the coupé the previous silver honeycomb grille with the round Fiat logo on its centre had been replaced by a new black grille, at the rear there were different tail lights. The spider sported a new grille with two horizontal bars, 5-bolts instead of knock-off wheels, as well as a new bumpers with rubber strips. Inside only the coupé received a redesigned dashboard and new cloth seats, with optional leather seat upholstery, front seat headrests were standard on the coupé.